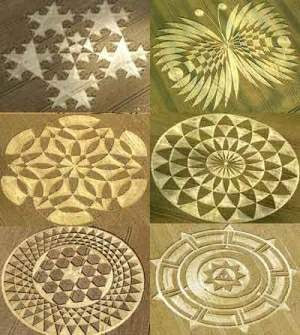 WHO IS MAKING THE CROP CIRCLES? 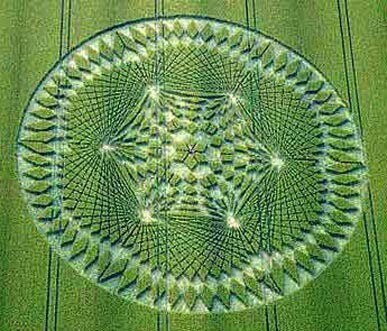 Interlocutor: Now, I would like to move on to the question related to the circles on the fields, we know that they are made by extraterrestrials, but we haven't still deepened about their real meaning. 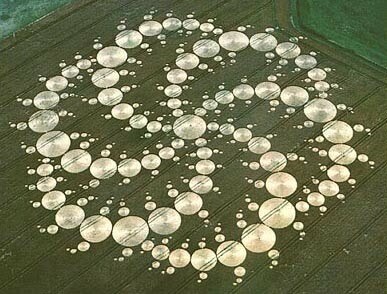 Ruanel: The circles are signs made by aliens to let know other aliens who also come to Earth that they were here and also to inform the messages they gave. Interlocutor: Is a single alien race the one that make those crop circles? Ruanel: No, there are several races. But there were also terrestrials that tried absurdly to replicate them with a tractor, something impossible to achieve at the level of the ground, because it’s necessary to have a perspective from the surface. You have the example of a painter who has a canvas at 5 or 10 cm. from his face... How could he paint something in perspective, if his eyes are closer to the painting and he cannot perceive that perspective? Ruanel: Those terrestrials who tried to imitate those crop circles with a tractor failed, since some of them have even a kilometer of distance. But they can be made easily be aliens from a space ship. Interlocutor: But what do they mean? Do they use the crop fields as a boy in school that uses a notebook to make drawings without any meaning? Interlocutor: This is precisely the dream of human beings! Ruanel: Yes, but at the moment those circles are warning to other contingents of extraterrestrials, I mean to the peaceful aliens who arrive to the planet that there are 157 belic conflicts on Earth. There were 156 and now the war of the U.S against the Afghans has been added, and at the moment it is not convenient any massive contact. Interlocutor: Concretely, the circles are made by aliens who have good intentions. Ruanel: Of course! Recently a movie called "Signs" was filmed and they are already exhibiting it in the cinemas and they are distorting the meaning of the circles completely, because they say that they are made by negative extraterrestrial entities that come to invade us. Ruanel: And the arguments it’s so simple that in the end they are defeated by water, because the writer imagined them vulnerable to this element. The basic and cretin thing of this argument gives is the fact that water is an indispensable element for life in all the planets of the universe. Interlocutor: The circles, then, are completely harmless? Ruanel: Yes, they are completely harmless. Ruanel: In these things there is always a previous evaluation. The general purpose they do goes beyond any individual interest. Interlocutor: I understand... There is always a conflict between the individual interests and the general interests, and it is not always clear what should be made, because sometimes it’s also important the individual's interest. Here we see it continuously with expropriations due to public use... But continuing with the topic, I ask: the meaning of the circles would be something like "the human race it is not culturally advanced for a massive extraterrestrial contact because of its difficulties to accept something different, and it is necessary to add that its aggressiveness would hazard the physical integrity of aliens that would love to be in contact with us, etc. etc. Ruanel: Yes, the example is valid, but the messages are not so general. The drawings are not the same in all the countries; this means that in every country there is a different evaluation. The design of the circles varies, for example, according to the grade of hostility in every place, since there are countries that are more belligerent than others. Interlocutor: Do these circles have connection with some Galactic Federation? Ruanel: There is no Galactic Federation as they think in the physical plane, because in the planet Earth, as usual, the countries were directed by a certain government, and for the future it is even planned a central government, they believe that the Galactic Federation is something similar. The Galactic Federation, and I will use an understandable term so that this vessel can decode it, it is a sector where there is a total democracy. The decisive centers that make decisions go shifting and one world is in charge during a time and another world will be in charge in the next turn. Interlocutor: But, Isn’t there a planet where they have their Central permanent headquarters? Ruanel: No, there is no such headquarters, they don't exist. There is no place where there is a higher commander who leads thousands of worlds. This would be equal to a monarchy. For that reason the commands- I don’t like this word because it doesn't give the exact concept of what I mean. They shift permanently. Interlocutor: Are there many confederate worlds, to call them somehow, or they are few? Interlocutor: Okay, This topic was properly clarified.